INDIANAPOLIS, Ind. – Whether you’ve already done your taxes or you’re waiting until the last minute, you deserve a break. Thankfully, businesses all around the country are trying to take some of the stress out of Tax Day by offering up deals and freebies. Applebee’s: Dollaritas! You can enjoy $1 strawberry margaritas through April 30. BurgerFi: Visit BurgerFi on Tax Day for $4.15 BurgerFi Cheeseburgers! Cicis: Get an adult buffet for $4.15 with purchase of a large drink on April 15. 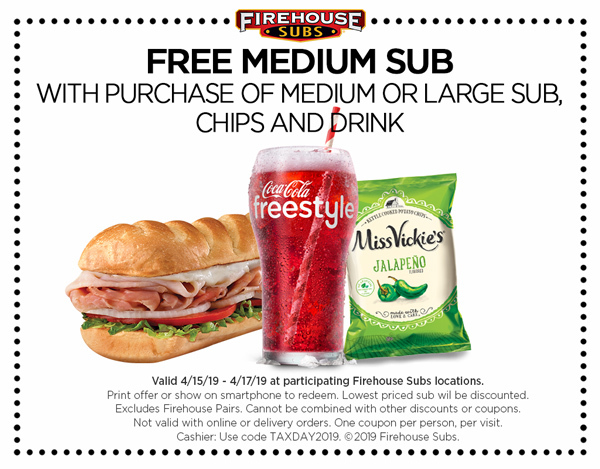 Firehouse Subs: Get a free medium sandwich with purchase of regular-priced meal. Deal good through April 17. Hooter’s: Kids eat free at Hooters with any $15 adult purchase. Office Max/Office Depot: Five free pounds of document shredding. Potbelly Sandwich Shop: Potbelly Perks rewards program members get a free sandwich on Tax Day with the purchase of a sandwich of equal or higher value through the chain’s mobile app.